The benefits of document management software include optimized document handling, improved data accessibility, streamlined file searches, and lower document management costs. In addition to these, having such tools around will allow you to get a tighter grasp on the security of your company files while improving collaboration by making data sharing easy. In this article, we’ll have document management software providers explained to help you understand the system’s purpose and consider if your business needs it. We also compiled some of the leading products in the niche to jumpstart your search if you decide to engage one. Document management is no easy feat. From drafting and editing to sharing and archiving, the whole process can take up a lot of time and money. In fact, according to research by Coopers & Lybrand, companies often spend an average of $20 to file a single document. The same study also concluded that inefficient document filing systems are not only troublesome for businesses but also costly. Misfiled documents can cost roughly $120 to correct while it takes $220 to reproduce a lost document if you consider the labor costs and processing fees associated with them. With these numbers, it only makes sense for businesses to invest in a good document management software. These tools will allow you to avoid mishandling documents as well as ensure that your files are safely stored in a digital database. Moreover, having one at your disposal will make it easy to pull documents later on when you or other team members need them. 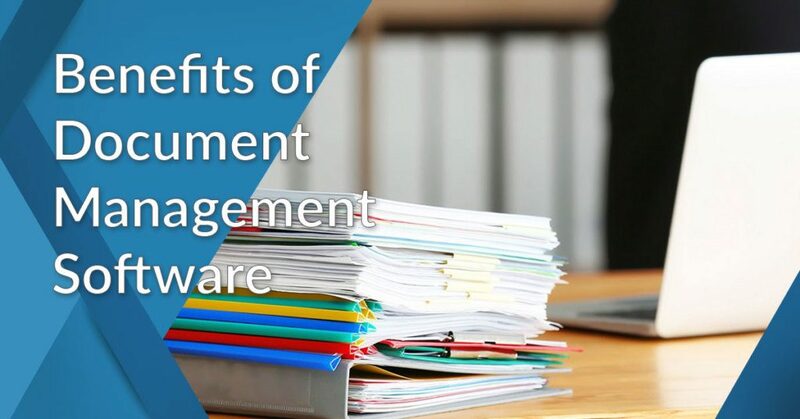 To help you further understand why investing in document management software is important for your business, we have prepared an in-depth explanation of its uses and benefits in this article. We even compiled some of the best practices you can apply once you implement your new document management system. This way, you can make the most out of your investment. Creation. The first crucial step is creating a plan. Establish rules on how you create various types of documents—whether they’re invoices, emails, balance sheets, sales brochures, and reports, among others—for consistency and easier organization. Decide on how you’ll store documents (which refers to its storage and how they’re organized) so you can determine how to simplify its retrieval. And finally, identify methods on how to keep your files secure. Implementation. The next step is ensuring proper implementation is followed by everyone in the organization. Keeping everyone on the same track with your rules is crucial, or else, setting up a document management system is ineffective. Consistency is the key to success in managing files. Hence, check your team’s performance and DM plan execution regularly. While it may sound simple, the steps mentioned are actually challenging to accomplish. 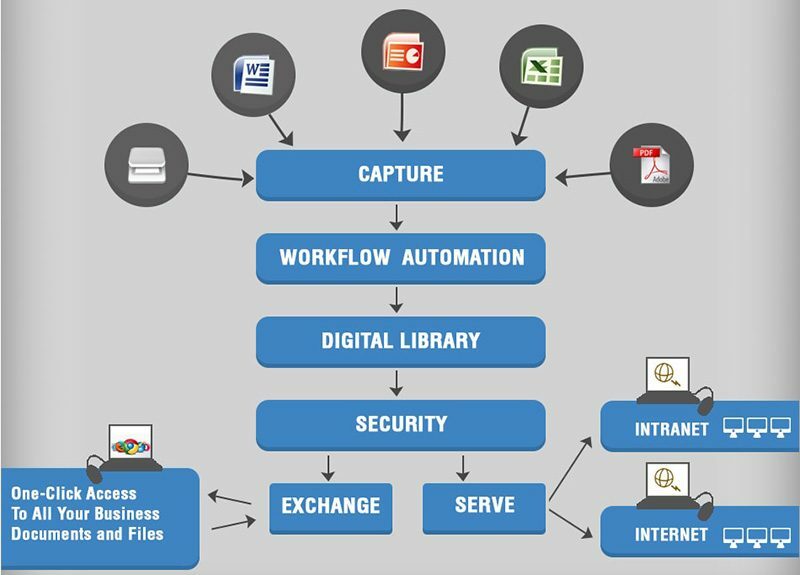 A solution that automates, streamlines, and optimizes these manual processes involves transferring into the digital landscape and engaging a software program for handling all your files. DMS (document management system) is the utilization of a software or computer system for archiving, managing and tracking documents. This modern approach to file storage handles digital files and paper-based documents that are image-captured or scanned. It serves as a precursor to content management by providing the most basic and fundamental functionality for the process. A leading document management tool, Wrike offers a comprehensive dashboard and intuitive features. Only 18% of businesses utilize a paperless system while the rest still use the traditional and manual process of a physical filing system. Organizations that haven’t adapted to the digital landscape yet are potentially losing to their competitors. Furthermore, they’re also likely to face an extreme disadvantage in the future global company as it is substantial for businesses to adapt and be flexible to new, dynamic environments. Identifying the purpose of document management software is indispensable to know whether it’s right for your business and if it will add value to your operations. It will also help you target the features and tools you specifically need in order to maximize them. We’ll list some of the advantages you can get from a DM system which may solve your organization’s problems and bottlenecks. Paper, as it multiplies, becomes burdensome when it turns an office into a storage space. It hits a company’s efficiency and security in the long run. An essential and primary purpose of document management software is to manage your organization’s digital documents efficiently and quickly with minimum operational costs. This helps your team members to be updated on each file they’re liable to and stay on track with their projects, including those in diverse locations. Drag-and-drop function. Users can easily upload files to the archive using the simple gesture of dragging and dropping them from your desktop. Templates. This speeds up the process of creating documents with uniformity while still being able to refine and customize them accordingly. Metadata. Customize document metadata and properties with descriptive information for categorizing, archiving, locating and retrieving files. Forms management. Helps users fill in information and create well-designed documents through properly-introduced metadata. OCR (Optical Character Recognition). Allows full-text documents, such as scanned ones, to be searched and indexed. Accessing physical files can be challenging because they have to be with you all the time. They run the risk of getting left behind and don’t allow working remotely. On the other hand, Most DM software programs let you access your files even when you’re on the go. You can use it on any computer or device, such as smartphones and tablets, so you can immediately make modifications at a moment’s notice. iOS and Android compatibility. Users may also install apps on their phone to access files in mobility. Mobile web interface. This allows users to access the system using their phone’s browser without installation. Import and export. Quick file import, export, and synchronization with the help of the software’s integrations. If you ever tried shuffling through a disorganized stack of papers and folders, you’ll know how much time is wasted doing the cumbersome task. The digital file system makes organizing, searching, and tweaking files easier to ease the painful process. Most DM software programs have optical character recognition technology to enhance file searchability based on its characteristics like the name and keyword. It may also be filed under several references such as name, date, and document number, among others. This expedites the process of retrieving the document through a full-text search box and index categories. Document searching. Eliminates the need for data entry as the document’s full content is automatically indexed by the system for quick retrieval. Storage. Having a single repository for all documents allows high scalability and files can be encrypted. You may think that a physical filing system doesn’t cost you money. However, companies spend $20 to find a single misfiled document according to research. It costs $120 to recreate a lost or damaged document. This can add up in the long run as companies lose an average of 2 to 5 files a day. Purchasing a document management solution is considered an investment because of the valuable returns it gives your company. Furthermore, it cuts down costs from ink, paper, postage and other supplies when printing documents. It also frees up the space occupied for storing physical supplies and documents. There are times when modifications must be done to a document. Using a physical copy requires printing the file again to add the changes. As required, it has to be reviewed, signed, faxed, or sent again. When there are adjustments to be made, you can easily transform your digital documents in the DM software because they are responsive. It also has a robust backup solution to ensure your files are saved and protected in case your computer gets broken or you face disasters, like floods and fires. Online editing. Users can edit files online simultaneously. Audit trail. When adjustments are made to a document, you get notified and view which actions are made by each user. OCR. This lets you make changes to scanned documents. Enterprises know the importance of keeping documents safe and secured, especially when they contain confidential and sensitive information. Failing to protect these can hurt your company’s integrity. DMS ensures all your files are protected by using role-based access control. This is an essential feature so you can regulate each user on which documents they can access and limit the actions they’re allowed to do. This safeguards your files from getting into the wrong hands. Files encryption. Protecting files from residing in your system using adjoining keys and algorithms. Two-factor authentication. An advanced security level to prevent hackers from accessing your documents. Knowing the victim’s password is insufficient to pass the authentication verification. Printing copies of the document and then comparing notes with your teammates consume time and waste physical resources. On the other hand, using the software lets you work together on a single file and receive real-time updates when changes are made to ensure everyone is on the same page when editing. By ameliorating information sharing, the documents seized from various sources can be accessed in multiple locations. Version control. An essential feature to monitor who obtained the file and what actions they performed. Document annotations. Comments or post-its placed on the document’s content where users can discuss and catch the attention of other users to a specific part. Check-in and check-out. The changes made to a document are synchronized so no adjustments get lost or overwritten. During a check-out status, the document may only be viewed and read. Workflow. It enforces corporate policies and gives you control of completion time. This improves efficiency and correct routing of the documents. Creating physical copies of documents uses a lot of resources, especially since it’s needed on a daily basis for many companies. Paper alone accounts for 25% of landfill wastes. Add to that the energy used by printers and the disposal of ink cartridges. Transferring to a digital storage lessens your company’s contribution to wastes and eliminates strenuous disposal work. These are only some of the benefits that may address your company’s DM requirements. Meanwhile, DM software programs aren’t created equal and each of them has capabilities and features that set them apart from each other. Hence, checking out some examples of document management software is vital to see which one fits your digital filing needs. Wrike. An industry leader in project management, Wrike offers a wide variety of document management tools. This allows you to create and edit documents with ease. It even has document assigning, sharing, and revision control tools to simplify collaboration with team members. In addition to these, Wrike also comes with native mobile applications so you can access the entire interface even while you’re on the go. If you would like to learn more about this product, you may sign up for a Wrike free trial here and test out its features for yourself. PDFelement. A robust yet easy-to-use PDF editor, PDFelement offers a complete suite of tools for creating, revising, and sharing PDF files. It allows users to perform everything from spell checking and commenting to data extraction and intelligent paragraph recognition without having to convert your PDFs to other formats. Feel free to sign up for a PDFelement free trial here to learn more about what this product has to offer. BizPortals 365. BizPortals 365 is a collaboration software equipped with features for document management, resource planning, and project management. It is built to help users simplify the creation and storage of documents in their database. With this, you can centralize files and keep track of any changes to your documents to avoid confusion in your team. As a digital workspace, this software is also completely mobile-optimized so you can access your documents even outside of the office. Pandadoc. A web-based document management tool, PandaDoc supports different file formats of digital documents. It allows users to build documents, lock content, and forward files in one convenient platform. The software even comes with various templates for business documents so that you don’t have to set them up for scratch. With this at your disposal, creating and editing quotes, contracts, and agreements is easier than ever. eFileCabinet. Geared towards small and developing companies, this software has one of the most secured DMS of today. It has numerous integrations for quick data migration, a variety of delivery modules, and swift file uploads. The cost of eFileCabinet depends on your chosen deployment—on-premise or in-cloud—and varies based on the number of users, features, and add-ons to ensure you’re getting a solution that accommodates your needs. Samepage. A comprehensive collaboration tool, Samepage is also known for its robust document management options. It is great for building and archiving documents as it offers email integration. The software also allows you to sync files across devices so that you and your team members have access to the most updated versions of your important files. Templafy. A dynamic DM system, Templafy helps the tech team, general and marketing managers of various departments including legal, administration, sales and marketing, human resource, and IT when it comes to handling documents. It has templates, cloud technology, real-time updates, and automation to elevate file compliance with your company’s brand and legal guidelines. Its pricing is on a per-user, monthly basis with a one-time setup fee. With its robust yet easy-to-use features, PandaDoc makes for a great example of a document management system. Document management systems are undoubtedly helpful in simplifying the creation, revision, and storage of official files. However, you should not expect these software solutions to automatically know how you want your documents to be organized. It is important that you put in some time to understand how to make these platforms work for you. One thing you can do to make the most out of its features is through the use of document management best practices. With these, you can fine-tune your digital filing process while maximizing your new software. Follow a Naming Convention. Document organization starts from the moment you name your files. With a disorganized naming system, it will be difficult to sort and archive your documents. This is why it is important that you follow a naming convention. As you build your naming scheme, consider how you would like to retrieve your files later on. You might want to start file names according to when they were created. In such case, you can add date stamps or version numbers to filenames to make them easier to track. You can also choose to organize documents based on their content category. Furthermore, you should try to set limitations on character counts and special characters for easier searching in the future. Create an Indexing System. Just because your documents are now digital and you can simply search the files you need doesn’t mean you no longer require an indexing system. There will be times when you need to scan documents for a particular topic rather than search for specific files. By creating an index for your digital database, it is easier for you to handle this task.